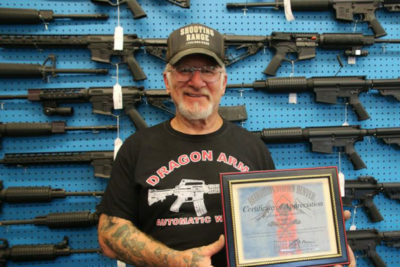 To Mel Bernstein, owner of Dragon Arms in Colorado Springs, storing an AR-15 in a synagogue is as common sense as any other safety measure. And in the wake of a massacre in Pittsburg that left 11 Jews dead, he’s putting his money where his mouth is. To those who would balk at an AR-wielding rabbi, Bernstein pointed out that a rifle in the right hands is no different than any other safety tool. Fox News reported that four local rabbis have accepted Bernstein’s offer and one has accepted a handgun instead. But not every synagogue leader is on board. Ader did admit, however, that he’s talking with Bernstein about purchasing a handgun. Another synagogue-goer, who asked KOAA to remain anonymous, echoed Ader’s sentiment. While she believes an AR-15 is “too big” to be used in a synagogue, she didn’t have a problem with a rabbi having a handgun. In fact, many of the people who attend with her already carry weapons when they attend services. Other Jewish leaders have been more forceful in their support of armed self-protection. “Jews cannot disarm themselves in synagogues or anywhere else for pacifist or utopian reasons because enemies will always seek to exterminate them. Even one armed Jewish man or woman in that synagogue could have made a positive difference,” said Dov Marhoffer, a Holocaust concentration camp survivor and Advisory Board member to Jews for the Preservation of Firearms Ownership. “Jews have no choice except to assume personal responsibility for having and using firearms to protect their own lives, their families, and their communities,” he concluded. Did jew hear what that guy said?! Free guns?! I know this rabbi. I also know Mel – I held my retirement party from the Air Force at his range, glorious day with 40 people blasting away.There\’s a big difference between American Jews and Israeli Jews. American Jews are still too much like their European forebears who valued cerebral politics and liberal ideology over life itself – it cost them 1933-45. Israeli Jews are becoming more and more like Old Testament Israelites….Canaanites in your way, they get slaughtered without a lot of hand-wringing or soul-searching. That\’s why the former hate Trump, and the latter love him. There is absolutely no permanent solution to violent criminal acts… Period. There is only preparation, prevention, and deterrence. We have not had 100% civil discourse since Cain & Able. What makes him think he can accomplish that goal? Jeff Adar is mistaken on a couple of points. 1. regarding the rate of fire of an AR-15. It will fire only as fast as you can pull the trigger. 2. It’s not a weapon of mass destruction. A bomb is a weapon of mass destruction. Poison gas is a weapon of mass destruction. A match, a gallon of gasoline and some blocked exits is a weapon of mass destruction. If someone enters the synagogue with an AR-15 and just starts shooting, there will be some time, a few seconds, when an alert person can return fire. You can’t return fire on a bomb. Personally I carry in church. My pastor knows and he also knows that others also carry. I don’t know who they are. It doesn’t matter to me as long as they know what they’re doing. With that in mind, I would think a deep discount on the AR or other weapon and a free safety class and perhaps advanced training on aiming, what to do with a jam etc. would be a better program. Overall though, I like the idea. It boggles my mind how many Jewish people vote for the kind of people that foment the same sort of hate as the Chancellor of Germany did in the 1930s. I can’t help thinking they have a suicidal subconscious. They certainly haven’t learned the lessons of the past. It is unfortunate that many American Jews have abandoned common sense for liberalism. I understand the history of their migration to this country. They faced less discrimination when they settled in big cities with more diverse populations. On the whole, hunting as a sport was not emphasized culturally. The idea of gun ownership for self defense in a country with stable rule of law was also not emphasized. They fail to understand that times change and self reliance is a skill that will always be important. Giving AR-15’s to a rabbi makes just about as much sense as arming school teachers. recognizing a citizens right to self defense is an awesome ideal should have been that way from the beginning though. Definitely! A teacher or pastor or whomever that finds themselves a target has great motivation to protect themselves and the people around them. Let them have the right tools and training to do the job – if they want to. We shouldn’t force them into that position. You’re a good man Mr. Bernstein. I applaud your kindness. As the article pointed out, not everyone thinks it’s a good idea, but it most definitely IS a good idea. Some are opting for handguns.. For those not very proficient who practice a lot with them, the AR15 would be a much better option for returning accurate fire. Much less likely to miss. To Mr. Jeff Ader, the AR 15 fires EXACTLY as fast as any semi automatic pistol. It’s NOT a machine gun any more than a handgun is a machine gun, plus, you’re less likely to miss the bad guy. Teachers in Israel have them, so should you. For starters an AR15 is not a weapon of mass destruction. A nuclear weapon is. This incident should have been a reminder to Jews & everyone else that there are now 6 million eleven reasons that Jews should own & know how to properly use firearms. This victim mentality should have disappeared years ago. Learn to fight & defend yourself & those around you. I haven’t been to synagogue in 20 years without a firearm. Most gun haters lack proper perspective of what has shaped this nation and what we must stand for. Survival of our nation depends on our ability to respect religious and personal freedoms of each other. at us by people who want us dead, be they sane of otherwise. We have the right to stop the deranged in any way we can and must, at a minimal loss as possible. This is only possible if we are trained and equipped well for such worst case scenarios. I applaud Mr. Bernstein’s generosity. yep. pittsburgh was a call to arms for synagogue-going jews same as charleston was for church-going blacks. when crazy evil mofos demonstrate they want you dead, no excuse not make ready, especially when you live in a gun-friendly, shall-issue state. We are all God’s children and we should all act like it. Unfortunately the majority don’t. The problem is not lack of guns – it’s gun phobia. The best way to cure a ‘phobe, (doesn’t matter if he’s Jewish or not), is to put him behind the trigger. Local ranges and clubs should do outreach to the Synagogues and offer free training and range time. Maybe only a few will try it, but those few will be able to show others that it’s really not so bad. Not everyone has to be “converted” for it to be effective. Just enough to provide one or two armed members at each service or event. Hoplophobic gun haters, who would ban all guns if they could, think merely the presence of armed citizens puts them in extreme peril. It’s a true phobia (a mental illness) same as someone who goes into a hyperventilating panic attack over a totally harmless snake. Never mind that just having gas lines in a house of worship to heat the place poses far greater potential danger than a properly carried handgun. What’s unusual about hoplophobics is that they actively spread their disease. Someone who fears elevators doesn’t try to recruit other people to have the same fear because they know it’s irrational. Gun haters think they’re right and everyone else is wrong in spite of the facts, which makes their phobia similar to psychosis. Even if some members are willing to get past their initial concerns and learn what they need to for self-defense, the neurotics still will do their best to keep all guns banned in places of worship and anywhere else they can. True words these. You are a wise person. The question is how can we help the hoplophobes get the treatment they need? To me, that’s the hard part. You are correct in your comment, srsquidizen. That is why they are impossible to reason with.